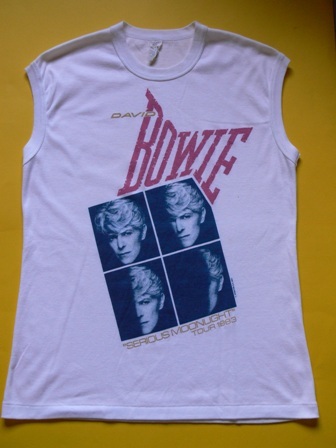 “Fashion turn to the left, fashion turn to the right” – and these teeshirts are sure to be the lates fashion with David Bowie fans. 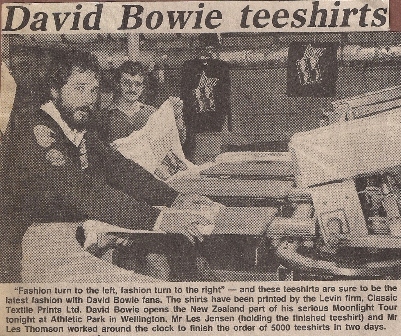 The shirts have been printed by the Levin firm, Classic Textile print Ltd. David Bowie opens the New Zealand part of his seriuos Moonlight Tour Tonight at Atlethic Park in Wellington. Mr Les Jensen (holding the finished teeshirt) and Mr Les Thomson worked around the clock to finish the order of 5000 teeshirt in two days.